Blue-black, glittering crystals which constantly give off violet coloured vapour (a process called sublimation) (Fig 7.2) with a peculiar odour. Lugol’s iodine (5% iodine with 10% potassium iodide in water). Tincture of iodine (2.5% iodine and 2.5% potassium iodide, or 2% iodine, 2.4% sodium iodide, 47% alcohol, and water). Povidone-iodine (5 to 10% iodophor, i.e. mixture of polyvinyl-pyrrolidone and iodine). *Iodex (iodine with methyl salicylate). · As a component of some expectorants (e.g. potassium iodide, iodinated glycerol), anti-asthmatics (e.g. iophylline), anti-arrhythmics (e.g. amiodarone), anti-amoebics (e.g. iodo-quinol), antifungals (e.g. vioform), antithyroid drugs (e.g. potassium iodide), and radiographic contrast agents (e.g. diatrizoate sodium, iopanoic acid, ipodate sodium, etc.). As a solution for prepaing patients for thyroid surgery (e.g.collosol liquid, which contains 8 mg iodine/5 ml). · Iodochlorhydroxyquinolone (clioquinol), which is an iodi-nated hydroxyquinoline, is used sometimes in amoebiasis. Iodine is used commonly to treat drinking water to make it potable. About 2 to 5 grams of free iodine, or 1 to 2 ounces of strong iodine tincture. The presence of food in the stomach inactivates iodine by converting it to iodide which is relatively innocuous. Locally, strong iodine solution can be an intense irritant. Systemic toxicity is due to combination of free iodine with serum sodium bicarbonate, leading to metabolic acidosis. · Initial manifestations of iodine poisoning include rhinor-rhoea, conjunctivitis, and cough (especially if fumes have been inhaled). · There is burning pain extending from the mouth to the abdomen, salivation, metallic taste, vomiting, and diarrhoea. o Vomitus and stools may appear yellowish (or sometimes bluish) in colour. Blue coloured emesis indicates the presence of food (starch) in the stomach and the conver-sion of iodine to iodide. · Skin and mucous membranes are stained yellowish brown. · Prolonged exposure to tincture of iodine can induce super-ficial necrosis. Eye exposure can result in severe ocular burns. · The following features have also been reported: glottic oedema, pulmonary oedema, delirium, hallucinations, convulsions, tachycardia, hypotension, metabolic acidosis, and renal failure. · Hypersensitivity reactions including angioedema and a serum sickness-like reaction may occur following oral, topical, vaginal (douche), or IV administration of iodine. · Iodides and iodophores (e.g. povidone-iodine), are much less toxic and usually require only supportive treament. But chronic poisoning can result from long-term thera-peutic intake of iodide salts leading to iodism which is characterised by metallic taste, anorexia, insomnia, lymphadenopathy, parotid swelling (“iodide mumps”), stomatitis, pharyngitis, conjunctivitis, rhinorrhoea, and skin manifestations (erythema, urticaria, acne, etc. together referred to as “ioderma”). · Hypothyroidism, hyperthyroidism, and thyrotoxicosis have been reported secondary to iodine exposure. · Iodine is a confirmed human reproductive hazard. a.Excess iodine is harmful to the unborn, as shown in many cases of pregnant women taking iodine-containing drugs. Several iodine-containing drugs have been associated with foetal goitre, including ammonium iodide, potassium iodide, and sodium iodide. b.Iodine deficiency is also harmful to the unborn. This has become evident in certain areas of the world where either the low iodine content of the soil or the practice of eating cassava as a major portion of the diet results in endemic congenital cretinism. Iodine deficiency can cause congenital goitre, delayed skeletal maturation, developmental delays, and perhaps a higher incidence of birth defects. Yellowish stains of clothing, skin (Fig 7.3), and mucosa. Vomitus or stomach contents when heated in a beaker will cause the iodine to sublime on a cold surface (e.g. a watch glass placed on top of the beaker with some ice).To 10 ml of vomitus or gastric aspirate, add 1 ml of starch solution. A blue-black colour will develop. Urine Test: Add 5 ml of chloroform and a few drops of nitric acid to 10 ml of urine. Allow to stand for 3 minutes. A pinkish-violet chloroform layer forms. To 10 ml of vomitus or gastric aspirate, add 1 ml of 10% silver nitrate solution and 1 ml nitric acid. Formation of a yellow precipitate which is insoluble in ammonia is characteristic of iodides. Whitish precipitate (soluble in ammonia) is characteristic of chlorides, while bromides produce brown precipi-tate which is insoluble in ammonia. Serum iodine levels are elevated, as also aminotransferase­. There is also hyperbilirubinaemia, neutropenia and hypox-aemia. o Skin: Wash thoroughly with soap and water, or 20% alcohol. o Eyes: Irrigate with water for 15 minutes. o GIT: If oesophageal injury is not present or suspected, gastric lavage can be attempted with starch solution, or 5% solution of sodium thiosulfate, or even plain milk. 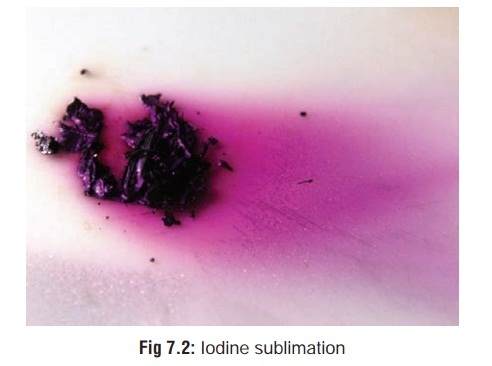 It has been suggested that soluble starch be administered, which forms a complex with iodine that is purple in colour and, therefore, may aid in the removal of iodine from the stomach by gastric lavage by making the iodine highly visible. Activated charcoal binds iodine, and can be administered. · Sodium bicarbonate IV for metabolic acidosis. · There is no specific antidote for iodine or bound iodine. · Treatment is primarily supportive and includes monitoring for the development of gastroenteritis, renal failure, tachy-cardia, hypotension, and circulatory collapse. Anaphylactic type reactions may occur as well. · Osmotic diuresis, chloruretic diuresis, and salt loading may enhance elimination. · Iodism is treated by ceasing iodide intake while enhancing the intake of sodium chloride which promotes excretion of iodides. Chloride competes with iodide at the level of the renal tubules. · Brownish or yellowish stains of skin and mucosa. The mucosal staining in the GI tract will appear bluish if starch solution had been administered while attempting to treat the patient. · Characteristic odour (rarely perceptible). · Congestion of viscera, especially the kidneys. · Most cases result from accidental therapeutic exposure where iodine or iodides had been administered in excess. Deaths have been reported even with excessive local appli-cations of povidone-iodine. The commonest abnormalities reported with such iodophore applications (repeatedly) are acid-base disturbances and metabolic acidosis. · Chronic poisoning can occur from prolonged therapy with iodides, or may be a result of occupational exposure. Iodinated radiologic contrast agents are well known to produce anaphylactic reactions.